A unique colorful space with a Hardoor SESAME TV wardrobe. The designer designed an amazing apartment with great attention to detail. The space has warm colorful tones, hardwood floors and accent pieces that give the décor its unique character. The closet chosen for the project is a Sesame TV by Hardoor that beautifully suits the interior’s vibrancy. It is 3 meters high, only a few centimetres short of the ceiling and is 6 meters wide. The Sesame’s level doors create a long and impressive, seamless glass wall. 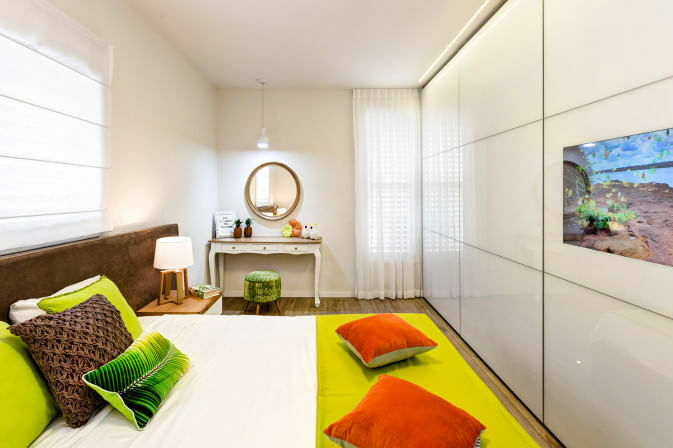 The wardrobe is white glass which creates an elegant and upscale look and merges nicely with the colorful design of the entire apartment.